Government of India launched new Money Saving Scheme for Daughters, Sukanya Samriddhi Yojana, where you will get 9.1 % interest rate on bank savings. Save girl child! Everyday large number of girl child is murdered. We often see it in news! To save girl child and provide education, our honorable Prime Minster Shri Narendra Modi ji has announced a scheme for girl child. You should know about this scheme in detail and spread it as much as you can. Here is through information about it. Prime Minister Narendra Modi declared this scheme for girls with the aim of providing education and marriage expenses of them. It is a small deposit scheme as a part of “Beti Bachao Beti Padhao” project. Moreover, it will bring yearly interest rate of 9.1% with income tax deduction under section 80C of income tax act, 1961. Want to open an account for your daughter? However, don’t know how to do it? Don’t worry; here are step by step instructions to open an account. 1. First of all download the “Sukanya Samriddhi Account” application form http://rbidocs.rbi.org.in/rdocs/content/pdfs/494SSAC110315_A3.pdf. 2. Fill up the application form with mandatory details. Moreover, attach the documents including Birth Certificate of Girl Child, and Parent’s Identity and Address Proof. 3. After completion of application form, you have to submit it at the post office. The scheme will be mature on completion of 21 years from the date of opening the account. You will get an option to keep the account till her marriage. Extension of account after her marriage is not permitted. Moreover, in case of death of account holder, the account should be closed instantly with death certificate of girl child. Furthermore, at the age of 10 years the girl child (account holder) can operate her account. However, the deposits in account must be made by her parents or guardians. 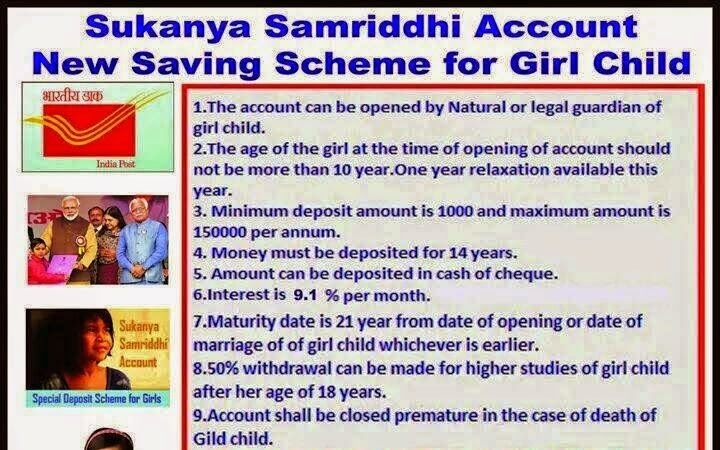 In addition, 50% of added amount in Sukanya Samriddhi Account can be reserved for girl’s higher education and marriage after she completes 18 years of age. What are you waiting for then? The scheme is very beneficial for girl child. Everyone should open an account for their daughters. Give benefits of Sukanya Samriddhi Account to your lovely daughters and let them live their dreams! 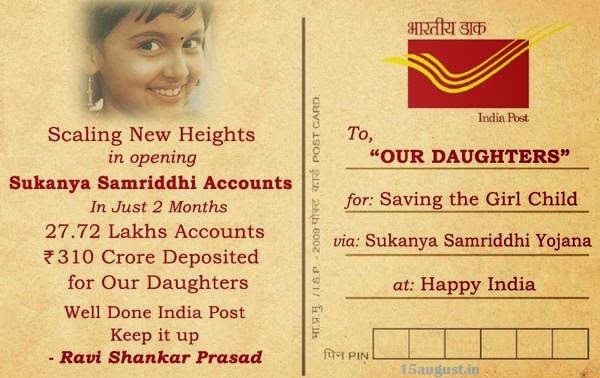 Update :- In just 2 months India Post opened 27 Lakhs Sukanya Samriddhi accounts; Rs 310 Crores deposited. Also check about Atal Pension Yojana.